Russell Drysdale’s images of Australia and its inhabitants helped define our national identity, capturing the essence of the country and the character of its people. One of the best-known artists of his generation, Drysdale’s art is on permanent display in major galleries throughout the country and he remains a household name. Drysdale is also one of a small handful of twentieth century Australian artists to have achieved significant international recognition during his lifetime. His work was acquired by New York’s Metropolitan Museum of Art in 1941 and is also represented in the Tate, London, and major private collections including that of Her Majesty Queen Elizabeth II. In 1954, he was selected alongside Sidney Nolan and William Dobell to represent Australia at the XXVII Venice Biennale – the first time Australia had participated in this pre-eminent international exhibition of contemporary art – and in 1969, his contribution to Australian art was recognised with a knighthood. 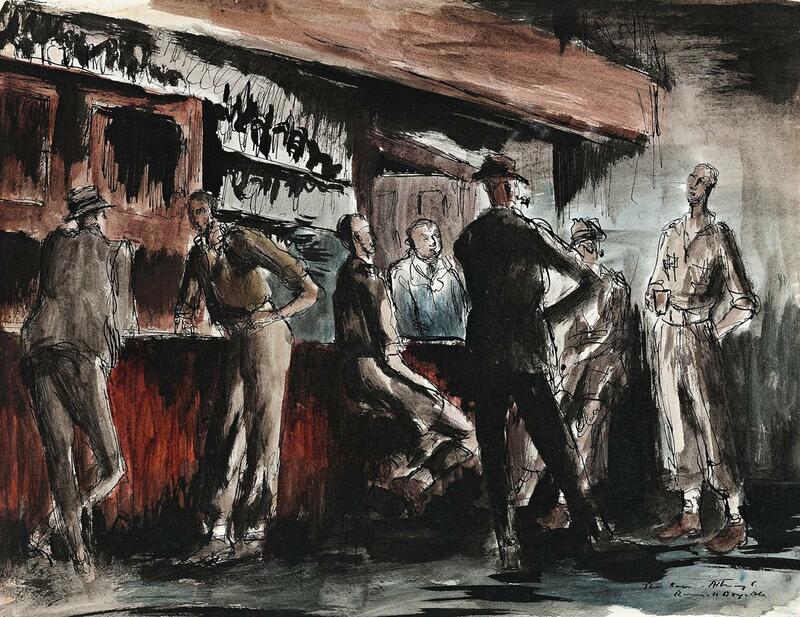 It is the presence of two soldiers drinking with their civilian friends in The Bar – Albury, c.1942-43 that links this drawing to the series of major paintings and works on paper that emerged from Drysdale’s experience in Albury, including The Station Yard, 1943 (National Gallery of Victoria) and Albury Platform, 1943 (Albury Regional Art Centre). Drysdale was a gifted draughtsman who once said that ‘drawing is as essential to an artist as practising scales to a pianist’4 and his facility is clear in this work where the figures and details of the interior are defined by quick but assured pen and ink lines, volume is added with a brush and black ink and finally, subdued tones of watercolour activate the composition. Both the setting and the relaxed camaraderie of the laconic figures make this a classic Drysdale depiction of Australian country life that is at once familiar and, almost eighty years on, also tinged with a sense of nostalgia.